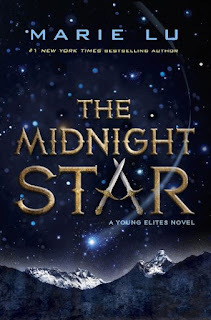 Google+ Reading Teen: THE MIDNIGHT STAR \\ Blog Tour and Guest Post with Marie Lu! 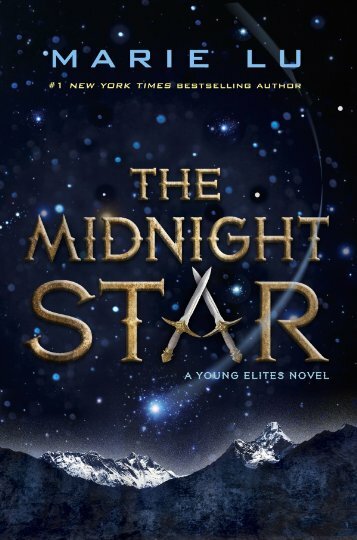 THE MIDNIGHT STAR \\ Blog Tour and Guest Post with Marie Lu! 5. Flying. I’ve had enough awesome flying dreams to know I’d like to do this, but only if I also don’t get my skin ripped off by all the crazy wind. 4. Metalbending. Magneto—and Toph—are pretty formidable. I would like to be formidable too, inside my custom metal armor. 3. Billionaire-ing. Let’s face it—money seems to buy all the superpowers you could ever desire. Iron suit that lets you fly? Check. Utility belt that does everything? Check. Batmobile? Check. Plus, you get to have a pretty nice house, too. 2. Traveling through space in the blink of eye. (Safely, of course.) If I could hop from galaxy to galaxy in a safe little pod, and see the universe—and whatever other life forms might be out there . . . . GIMME. The thrilling finale to the New York Times bestselling Young Elites series from "hit factory" Marie Lu. There was once a time when darkness shrouded the world, and the darkness had a queen. Adelina Amouteru is done suffering. She's turned her back in those days who have betrayed her and achieved the ultimate revenge: victory. Her reign as the White Wolf has been a triumphant one, but with each conquest her cruelty only grows. The darkness within her has begun to spiral out of control, threatening to destroy all that she's achieved. Adelina's forced to revisit old wounds when a new danger appears, putting not only Adelina at risk, but every Elite and the very world they live in. In order to save herself and preserve her empire, Adelina and her Roses must join the Daggers on a perilous quest- though this uneasy alliance may prove to be the real danger.